Enchiladas Ay Carumbaaaaa! | Food E.
I know you guys have been staring at that One Mug Brownie picture for a long time now, and you’re like, “Gaaaaahd Lauren, switch it up already.” Your wish is my command. Note: do NOT buy enchilada sauce. You will die when you see how easy it is to make. And it tastes just like the real deal enchilada sauce you buy from the grocery store, only it’s fresh and you made it without all the preservatives and other nasties you find in store bought sauces. Preheat oven to 375 degrees. Spray a 9″ x 13″ pan with nonstick cooking spray. In a medium sized saucepan, heat the olive oil over medium heat. Add tomato paste, flour, and spices and stir until blended, 1 minute. Whisk in broth and bring to a boil. Reduce to a simmer and cook around 8 minutes, or until thickened. In a large bowl, combine shredded chicken, black beans, corn, green onions, cilantro, cumin, and 2 cups of the shredded cheese. 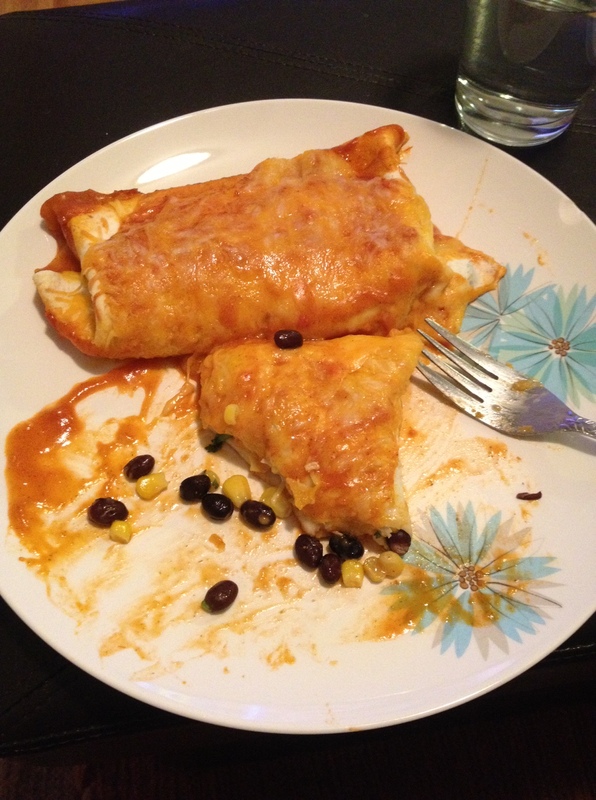 Spread a thin layer of enchilada sauce in the bottom of the 9″ x 13″ pan. Fill each tortilla with an ample amount of filling, tuck in the ends, and nestle seam-down in the sprayed pan. Pour remaining enchilada sauce over the enchiladas, careful to cover them as best you can. Sprinkle remaining cheese on top. Bake for for about 20 minutes. Garnish with extra cilantro.